As a trusted advisor to organizations of all sizes, Optiv helps align security programs with business priorities. We assist organizations seeking to meet relevant legal, regulatory and contractual requirements. Our experienced professionals offer the guidance and heavy lifting you require to elevate your current security strategy. 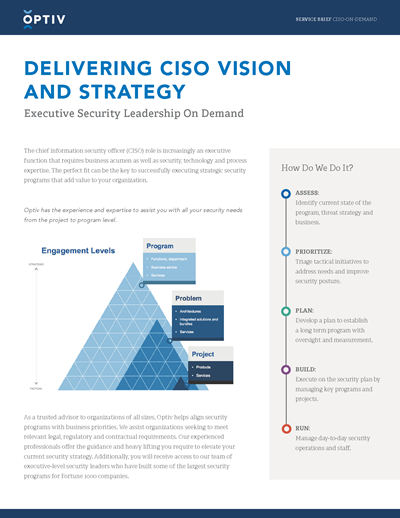 Additionally, you will receive access to our team of executive-level security leaders who have built some of the largest security programs for Fortune 1000 companies.